Yuki and I have been wanted to do this for a long time. It's as simple as getting some vegetables, meat, fish balls, and soup base. But it's just not cost effective, so we just opt to eat out for our hot pot fix. But after eating some great hot pot with my friend from out of town last Sunday, we decided to pull the trigger. It motivated us to plan it for tonight. I'd grab all the ingredients before hand and Yuki would show up at my place where I would have everything all prepared. Preparing for it was easier than preparing for cooking a western meal. Shopping around the Carrefour, it was so much easier finding the ingredients and with so many choices. 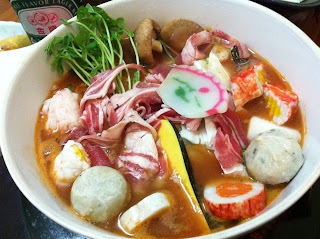 They have hot pot assorted vegetables and roots packages for singles, doubles or triples. Next, they have specific meat cuts for hot pot. And don't get me started on beef balls, soup dumplings and fish paste balls (and various shapes, no english name for this that I can think of). They have freezer cases full of these in just about every brand, shape, filling and size. It was all too convenient. However it still took me a while to shop because I couldn't decide. Usually I spend too much time there because I can't find what I need. Anyways, as for the soup base, Yuki wanted to introduce me to a Japanese tomato base hot pot. Taiwan conveniently also imports this Japanese brand. So in the end, the DIY hot pot at home was a success. Although the tomato hot pot was delicious, I still prefer my mongolian mala (麻辣) flavor. Next time time on hot pot at home, it's going to be spicy! Just in time, because the evenings are getting really chilly here (22 Celsius).